This dropped C monster was released on The Concealers in 2009. The band's guitarist Emil Werstler is here to teach you how to play it. "Wilting On The Vine" features a killer down picking main riff and a blistering solo, so make sure your chops are up to par before tackling this beast! I hate learning most of the song to find out the tab in the solo is wrong..... cool song though. hi emil ! may i ask how to get such metal tone? which pedal do you use or is it a processor? I am pretty sure he used a tubescreamer into a crate solid state head and unknown 4x12. The tubescreamer is a big part of this sound imho. He refers to everything in the lesson as if the guitar was tuned to standard dropped d. It makes explaining things easier for most guitarists I think. This is amazing. Can't wait to Drop C my guitar. Why does Emil say Drop D on the Introduction video? Why did he says if for theory purpose? Emil Werstler teaches this song from The Hinderers by his band Daath. Emil Werstler teaches you how to play the first song on Daath's The Concealers. The song features unmistakable signature Daath riffing and unforgettable lead playing from Mr. Werstler. Emil Werstler teaches this heavy hitting metal song from Daath's album The Concealers. Tune your guitar to Drop C and get warmed up, 'cause this is a beast of a song! Here is Chimaira's "All That's Left is Blood" from Crown of Phantoms (2013). 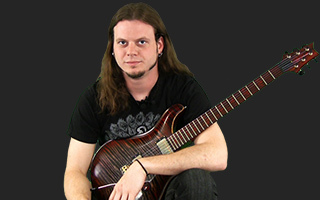 Emil Werstler of Chimaira teaches you how to play "I Despise" from Crown Of Phantoms (2013). Grab a 7-string, tune to drop A, and get ready for some molten riffing madness!